Happy Friday, friends! Today it’s all about stitching progress and a few discoveries along the way. Earlier in January, we looked a stitching project that’s in my project rotation for 2017. It’s this miniature Tree of Life tapestry kit designed by Natalia Frank. The piece is worked on 56 count silk gauze, using silk threads – some 89 glorious colors of silk! I decided to repackage the threads, putting all the threads on the card and all the threads in the bags into smaller individual zip lock bags, all the same size, and numbering them in the outer right corner of the bag. I punched holes in the corners of the bags, and strung them in numerical order on a large ring. It was also while working on this panel that I decided I needed a new approach to my 15 Minute Policy, if it this project was going to fit in with that policy. 1. 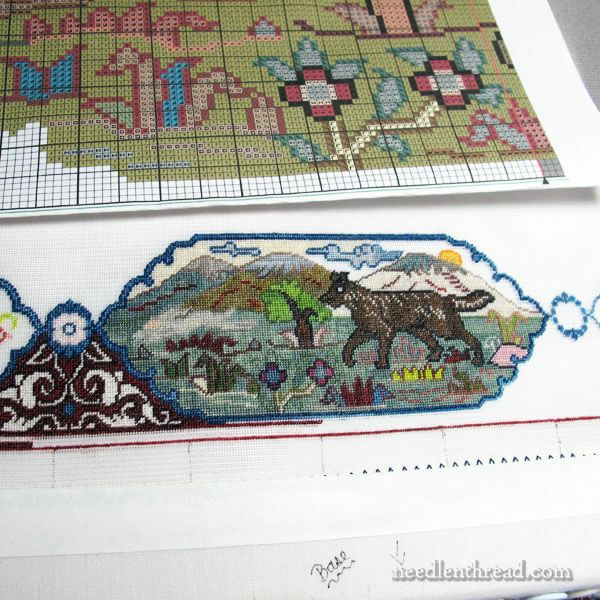 Even if you can only put 15 minutes into some stitching each day, you will see surprising progress – more so than if you wait until you have a large chunk of time to indulge in stitching. 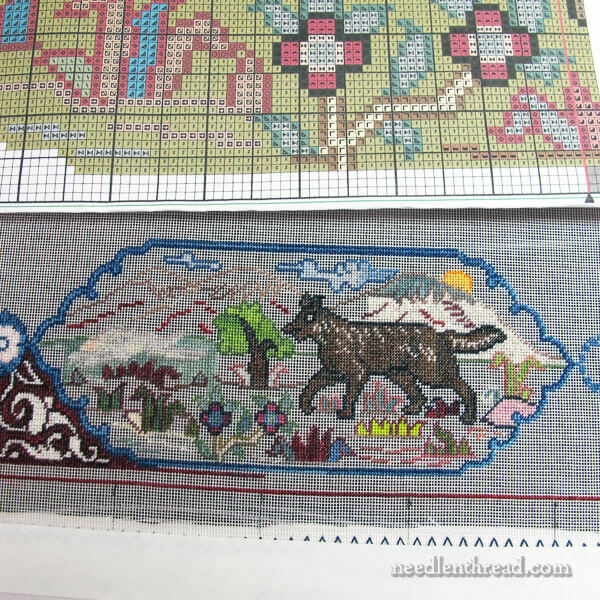 So, 15 minutes here and 15 minutes there will move your embroidery projects along more quickly, and seeing the progress will keep you motivated. When I was working on the project in larger chunks of time, I worked all the little elements outlines (many of the elements are outlined in different colors and then filled with one color). Then I could go in during a 15-minute bout and fill an element or two without having to count. I also left all the backgrounds that are filled in with the same color to attack in 15-minute bouts, or to work on when I want totally mindless stitching. I don’t have to count them, I don’t have switch colors, and I don’t even have to think about what stitch to use. It’s a perfect recipe for quick stitching sessions or mindless stitching when other things are going on and I can’t (or don’t want to) concentrate much. This is the lower panel, almost finished. Half the sky isn’t filled, and I just realized that the dog’s eye isn’t filled, either. Kind of creepy! I switched around some color choices in this panel, and I figured out that a few of the overdyed thread colors can be rather stripy (you can see what I mean on the rump of the dog), so in future panels, I’ll approach the overdyed threads in large spaces a little differently. My next step on this project is too work the entire blue scrolly frame around the whole piece. From there, I’ll work the insets in the side panels and corners (can’t wait to do the peacock!) and the decorative background of the frame. All of this, of course, will take a lot of time, so you probably won’t see fast progress on this one! But I sure am loving it. It’s a gorgeous piece, and I like the challenge of working on the tiny gauze. Have a terrific weekend! I hope you can squeeze in some quality time with your needle and thread! You are an amazing artist! Love everything you do. I’m working on an appliqué project that has been sidelined for way too long. Your 15 minutes a day of stitching is exactly what I’m going to try. I’m not that far from finishing and your tips came at the perfect time for me!! Thanks. I sure appreciate your blog. I enjoy each and EVERY post . . .although, I don’t often comment. Ab-so-lute-ly Gorgeous! Love the colors! The teeny-tiny stitches nicely cancels out that “sideways” look of the tent stitch. Looking forward to more drool-worthy photo updates! It’s really interesting to hear the thoughts that go on behind the scenes! Ah! 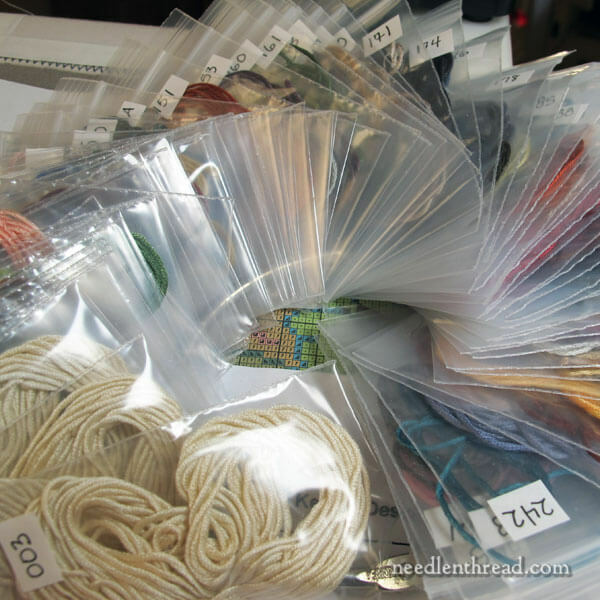 Another convert to the Floss Rolodex method of thread storage. Sooo convenient! And since you have put the hole in the bag and not the area above the seal, your floss can breathe. You’re braver than I am, working on such tiny gauze, but I’m glad you’re having fun. Gosh, it’s so gorgeous!! I just got a couple of miniature kits (Sense of Hearing and a unicorn) and I can’t wait to start, but you keep dispensing good tips. I like to start at the top right and work down and left. Oh Mary, I do love it when you jump right in to a Really Big Project!!! – I’m going to enjoy every single stitch with you and pick up all of your top tips along the way! As I read the first few paragraphs, I started thinking back to all the counted work I used to do and decided that for this piece, I would first stitch all the blue scroll borders to reduce the counting later on. I’m so glad that you decided to do that! I think that will make the rest of the piece so much easier. This design is gorgeous and tempts me to try counted work again. Mary, Mary, Mary, you keep leading me down into dangerous territory (but I’m not really complaining)! I LOVE these little rugs. I’ve done work on 40 count gauze, but never 56. The designs are stunning. You’ve made wonderful progress in such a short time. When you first showed this project I went to Natalia’s site and drooled, but it was sold out at the time. I’m happy to report they are available now, and Tree of Life 3 will be coming to my home. I only hope my eyes will hold out long enough for me to finish! Thanks for sharing your beautiful work and love of needlecrafts! LOl! Sorry, Mary! But you’ll definitely love it! I’d love to collect all the Tree of Life designs Natalia is putting out (I think there are four altogether), but the latter ones are beyond my budget. The first one was a Christmas present (thanks, Mom! ), and I really love it! Hi Mary. This looks beautiful. I can’t even imagine trying to stitch without my magnification glasses. I can barely thread a needle with my regular reading glasses! Is this pattern stitched in mini-x-stitches or is tent stitch? I can decide when I look at the photos close up. Love your project, looks like it is coming along just perfectly. Your art work (embroidery of all kinds), is just wonderful. You do inspire me. I like the idea of having the working threads in plastic bags, marked and in order. Sure would save a lot of time. Now I have to put my knitting away so I can get at my embroidery. I’m working on a petti point picture of a tabby cat. I love doing this type of work. Mary I have a question about the threads in the bags. 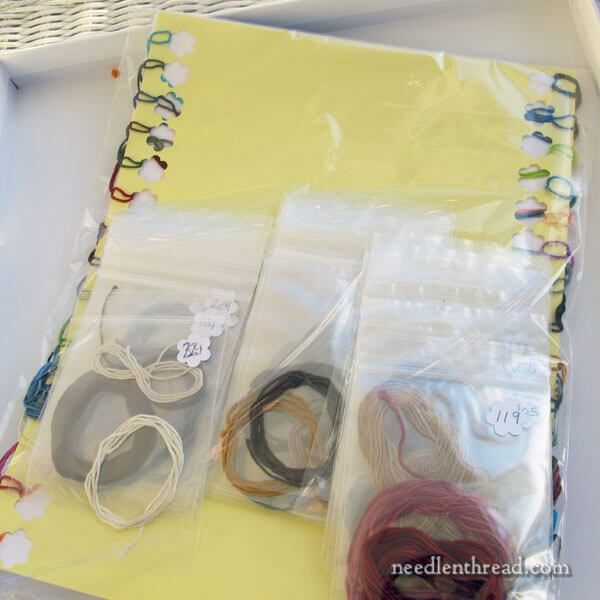 How do you wind or wrap the threads to place in the plastic bag? Is there a special way? I hope this makes sense. If it was a whole skein then I would leave it the skein but not sure what happens when you take them off the hole punched card. I love the Tree of Life design. 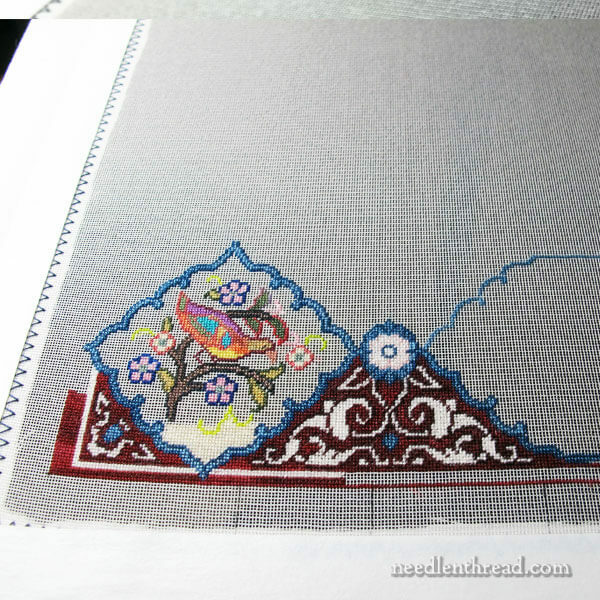 I am attempting a 40 count silk gauze Persian rug design, but have not stitched very much of it as yet. Hi Jude – I cut the threads to the length I need for this project (so I don’t have to do any cutting when I grab a new thread) and just wind them in a circle and stuff them in the bag. 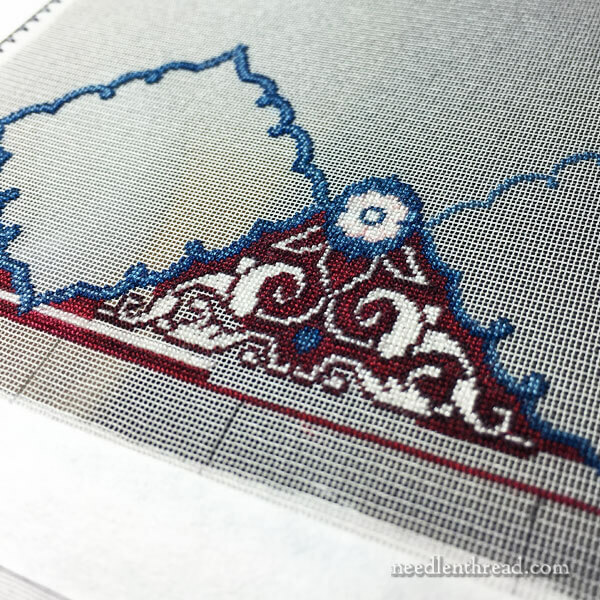 With the particular thread used in this project, the lengths I cut are no more than 8- 10″, because the thread tends to look fuzzy if it’s used for too long. That may sound like a very short length indeed, and on normal projects it would be, but at this high of a count, with tent stitch, 8-10″ of thread can cover a lot of space. On the other hand, many elements in the design are so small that you’re only using even half that amount of thread to get that particular in. Wow! Just…wow. That is coming along beautifully. Mary…I am in awe!!!! 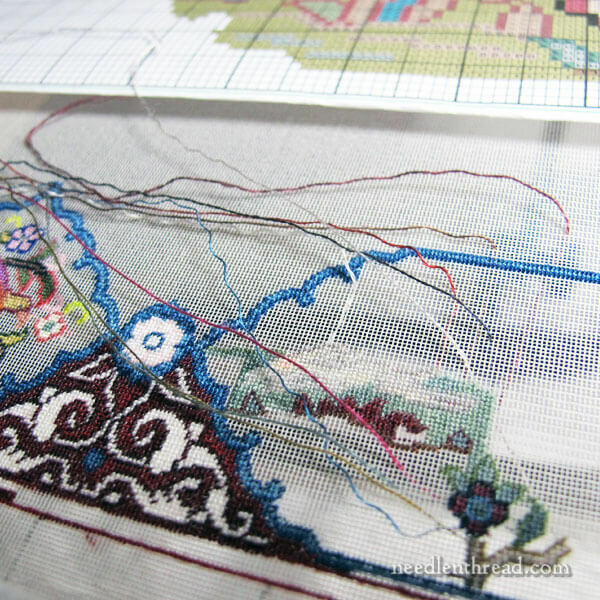 What tiny stitches…and you have so many completed already! Thanks for letting us all watch the progress of this project! And for your wonderful explanations as to what you are thinking is going well and what is not! That helps me to think through whatever project I am working on at the time! Nice job, Mary! I have a question that you may have addressed elsewhere, but I cannot find it the answer. What do you do with “leftover” thread? The project you are working on has lots of places where you would stitch a few stitches with a single thread and then you would be done with that color for a while. Do you put the unused thread loosely back in the bag. Do you save it? How do you keep things from getting in a tangle? Love this project. I can’t wait to see how it develops. Hope you have a wonderful and relaxed weekend. I put unused thread back in the bag for this project. The project is so vast that, chances are, I’ll be running into that color again down the road, anyway. But if you’re talking about single threads that I’ve stitched with and then finished off and cut, those usually go by way of the orts jar or just the trash. This thread (it’s a spun silk as opposed to a filament silk, which would be stronger and less prone to shredding or fuzziness) doesn’t stand up to the harshness of the silk gauze – it tends to get shreddy or fuzzy fairly quickly – so if I’ve stitched with even five inches of it, that thread won’t look as good as a new thread will. I cut the threads no longer than 10″ and sometimes, only 8″. If you don’t want to put a hole in the bags for a ring you can clip them all together using a binder clip. It holds quite well and it even still has a ‘loop’ to hang from a hook if you want. Can you let us know how many stitches you can do in 15 minutes? I’m trying to calculate how long a project like this will take, so I can decide if I can squeeze it in…Thanks! Hi, Holly – I haven’t timed it. It really depends on what part of the design, whether I’m stitching with two hands or one…how many interruptions…all kinds of stuff. But I’ll try timing it! I have been following your your posts and I must say that you have woken up the desire to stitch again. You have amazing talents. Now, I am confused and don’t know where to start because there are so many beautiful things to make. Lol. I have a habit of taking on challenging things…like the home sweet home embroidered workbox I am dying to try. Lol. So, seriously, I need your guidance on how and where to start again, what tools to get, etc. I hope this is not too much to ask. Hi, Soenie – If you could take some time to browse through the Tips & Techniques section, you’ll find a list of Beginner’s tips. That’s a good place to start!